The Case of the Vanishing Diamond by Fred Rexroad. A Whiz Tanner Mystery. Review: Have you ever really wanted to solve a mystery so badly that you started your own mystery business? 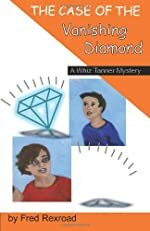 In the well-written book The Case of the Vanishing Diamond, by: Fred Rexroad, two ordinary kids named Whiz and Joey have their own business. Whiz and Joey are two very intelligent kids who have a lot of experience when it comes to solving mysteries. But the most unique characteristic about these two kids is they are only in middle school! How awesome would it be that every weekend you would get to solve a mystery? In my opinion it would be pretty cool to be able to solve a mystery every weekend. But this isn't about me it's about the fantastic book The Case of the Vanishing Diamond, the 4th book in the Whiz Tanner mystery series. It is an early morning in Joey's house when suddenly he hears a knock on his window. When Joey sees what's on his window he is not surprised that it is from his partner. When Joey gets to the secret hideout (Whiz's shed) he says the voice command password. Neither Whiz nor Joey knows what is going to happen later. Soon they find out that the coin shop, jewelry shop, and an auction house had been robbed. There is one factor in particular that is fishy in this case. The same day that the three stores were robbed was the day a well-known magician came to Jasper Springs for auditions. The two detectives had attended the auditions as well since Whiz and Joey are very good magicians, and the two middle-school kids had wanted to show off their skills. But back to the case, if you asked anybody they would definitely say that it is fishy to have a magician in town at the same time as a robbery. But if you want to know if this magician is guilty then I guess you are going to have to read The Case of the Vanishing Diamond. The Case of the Vanishing Diamond is an outstanding novel for anybody, but especially for mystery lovers. It is the perfect read for ages 8 and up. Because it is not too difficult to read, but at the same time it is not an extremely easy read. But if you love mysteries, The Case of the Vanishing Diamond is perfect. I couldn't put the book down because every chapter is full of suspense and thrills, so if you are going to read this book be prepared to not put it down because you will get sucked in. But in my opinion the best part about reading this book is the end of it. Like most mysteries the best part and most intense is the ending when the detectives set traps and unmask the robbers. Well if you want to figure out who stole from the three stores I guess that you are going to have to read The Case of the Vanishing Diamond. So go to your nearest book store or library and read the outstanding book The Case of the Vanishing Diamond. Review written by Ryan (6th grade student). We would like to thank Fred Rexroad for providing a copy of The Case of the Vanishing Diamond for this review. Have you read The Case of the Vanishing Diamond? How would you rate it?